Background: Rough-skinned newts are relatively common salamanders and more likely to be seen in the open, day or night, than any other species in our area. This brazen behavior is attributable to the protection afforded by the powerful neurotoxin it possesses (originally described as “tarichatoxin”), the same deadly chemical (tetrodotoxin) found in species of puffer fish, which in even tiny amounts can cause paralysis and death in most animals. However, one predator, common garter snake (Thamnophis sirtalis), is tolerant of the toxin. 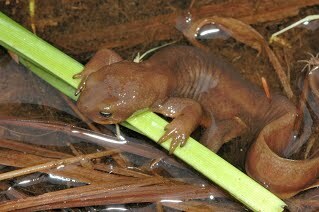 Rough-skinned newts, when threatened, may assume a display posture, sharply raising the head and tail to show the brightly colored underside. This posture, known as the “unken reflex,” represents a warning to potential predators. Bright color used as a warning to potential predators is known as aposematic coloration. At low elevation sites in western Washington, rough-skinned newts can be observed migrating to breeding sites in streams and ponds as early as January, but do not breed until March or April, when individual females sometimes attract large aggregations of males. Adults and Juveniles: Adults are medium to large-sized (5-8 inches total length), brown or orange-brown, with a rounded snout, rough glandular skin, and a bright orange or yellow-orange underside. During the breeding season, males enter an aquatic phase, with smoother skin, laterally flattened tail, and rough patches on the hind legs (nuptial pads). Males at this time also have conspicuously swollen vent lobes, whereas females have only a slight conical swelling around the vent. Newly transformed juveniles have rough skin and resemble much smaller versions of terrestrial adults. Larvae: Larvae have long gills and a high tail fin. Small larvae are similar in appearance to northwestern and long-toed salamander larvae, but differ in a more narrow and pointed snout; and because of the shape of the head, the eyes look slightly forward. A faint horizontal stripe may be discernible from the snout through the eye, and there are one or two distinct rows of white or slightly yellow spots along each side of the body and tail. Older larvae may assume a light orange or orange-brown color. At low elevations, larvae metamorphose in 4-5 months. At higher elevations or other cold water settings, larvae overwinter and may not metamorphose until their second summer. 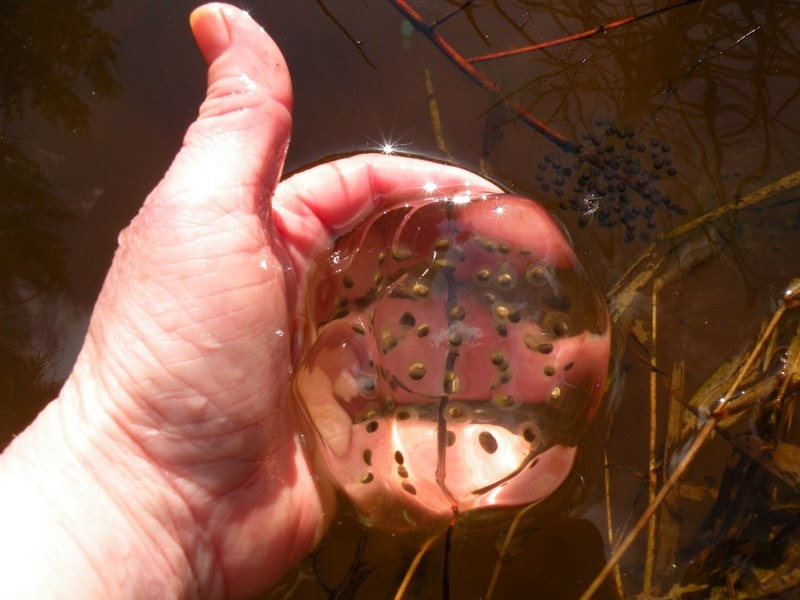 Eggs: Eggs are laid singly attached to submerged vegetation and so well concealed that they are infrequently found. Habitat: Rough-skinned newt is primarily a forest-dwelling species. Breeding habitats include ponds, wetlands, lakes, road ditches, and slow-moving streams. Locations in Whatcom County: Rough-skinned newt occurs from southeast Alaska to northern California. In Washington, populations are primarily distributed west of the Cascade Crest and in forests east of the Crest. The distribution of this species in Whatcom County is not well documented.